Update: This is now a feature that’s built directly into the Software Licensing add-on for Easy Digital Downloads. It can be accessed in Downloads > Settings > Extensions > Software Licensing. From there check the box for “Disable Discount Codes on Renewals”. Recently I had a question about Easy Digital Downloads – Software Licensing that I hadn’t thought about before. 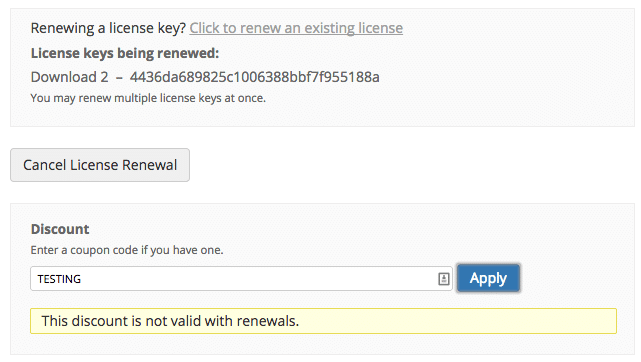 When offering a renewal discount, how can we prevent any additional discounts from being applied to the cart? You see, depending on the discount code someone has, you could be losing money if you offer a discount to renew a license, and then a discount code is used on top of that. If you would like a single-file plugin for this, you can get it from the EDD Library.